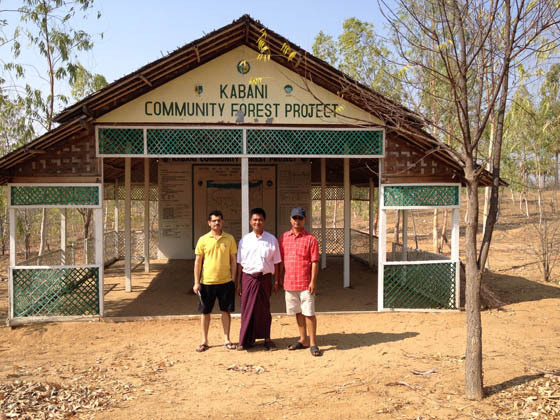 On 26 March 2015, Thursday, an ICIMOD team comprising REDD+ Initiative Coordinator Bhaskar Karky and Communications Specialist Gopilal Acharya made a visit to Kabani Community Forest Project in Bagan, Myanmar. The site visit was part of the ongoing scoping missions headed by Bhaskar Karky. 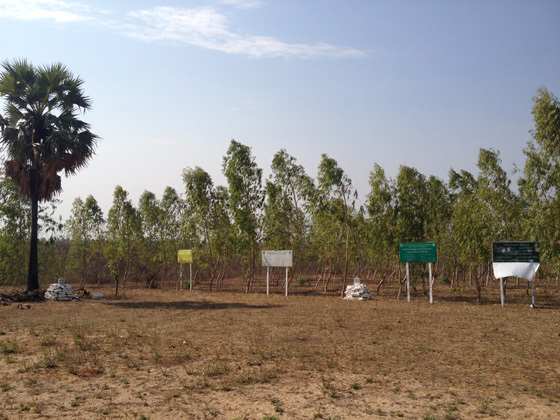 In Myanmar, the site in Bagan was recommended by the Department of Forests under the Ministry of Environmental Conservation and Forests, Government of Myanmar. The ICIMOD team arrived at the site at 2:30 pm, and was met by the Deputy Range Officer, Win Swe Oo, of the Forests Department. He then took us to the site located at Yuaung U Township. The township is a parched patch located within the Dry Zone. The Kabani Community Forest Project was established in 2009 and funded by Japan International Forestry Promotion and Cooperation Centre (JIFPRO). The Project is managed by 191 households of Kabani and Yedwin Nyaung Pin villages under Yuaung U Township. The community forest covers 300 acres and was established in four adjacent sites in four different rolling-year phases. All four sites are of 75 acres each and have species like Eucalyptus, Neem, and Acacia. The zone is extremely dry with the annual rainfall of 24.6 inches on average. Therefore, water is mostly channeled in from the nearby Ayeyawady River. At the time of our visit, we were told that the villagers were in the process of making fire lines since the hot summer (mid-January to mid-May) is also the fire season when numerous fire incidents are recorded. Deputy Range Officer Win Swe Oo said both men and women work in the community forestry. Villagers collect firewood and poles for domestic purpose. Mostly pruned branches are used for firewood. The community has also developed a Management Plan with help from the local forestry office. Observation: Deputy Range Officer Win Swe Oo seemed interested to carry on the management of the Kabani Community Forest Project. He said they need more capacity building. As young trees begin to look promising, people’s interest in nurturing and using services from the forest they manage has been taking deeper roots in the area. One of the main activities under the REDD+ Initiative will be to investigate and develop a Timber Value Chain that holistically explores every stage of the chain from forest to the market. Therefore, on 28 March 2015, Saturday, the ICIMOD team visited Sein Furniture, a wood-based design and production centre in Mandalay. Sein Furniture produces all kinds of finely designed and carved household furniture, from sofa sets to chairs and beds. The centre mostly uses teak wood bought from various sources, including the government-run production units. The owner of the centre, Myo Thant, 51 years old, said the wood mostly comes from upper Myanmar. Myo Thant said quality wood was very expensive and came for Kyat 1.8 million per ton. However, lower grade wood came for Kyat 0.75 million a ton. He sells a five-seat carved sofa set for Kyat 1.8 million. A simple teak chair costs USD 65. He also exports teak furniture to buyers outside Myanmar. He said carved furniture are more expensive than simple plain ones. Observation: People are either reticent or ambiguous when asked about the source of wood, possibly fearing backlash from the authorities. However, they say production could be increased if they managed to get wood on time and for reasonable price.